Well the day is starting out dark and rainy but looks like it should be clearing off. I decided to share an image I think of as nature's firework. This is an Echinacea also known as a Cone Flower just beginning to bloom that I captured last week just after a rain. 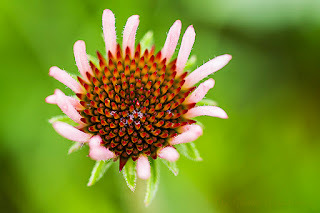 This is also to note that this Blog contains pages of Wildflowers in Kansas that I have separated out by color to help you find and identify the more common ones you may find and wonder what they are. Hope you will take a look. The links can be found at the top of the page. On phones it appears as a drop down, at least on Android.